Brightness control in Windows works but only if I install a graphics driver. Is it possible to control brightness without installing a graphic driver? In the BIOS, the control works without any driver. Colour me curious: why wouldn't you want a graphics driver installed ? Because WinXP x64 in EFI mode does not boot on the Intel graphics driver. OK anything XP 64 bit is utterly foreign to me, so I'll just wish you the best of luck in your quest. Wait, which Intel graphics driver did you use for the HD 3000? Was it this driver? Yes, this is version 14.51.11.64.5437. I tried also older drivers e.g. from Asrock H61M-DG3/USB3 - 14.51.6.64.5415 but WinXP x64 still not start. 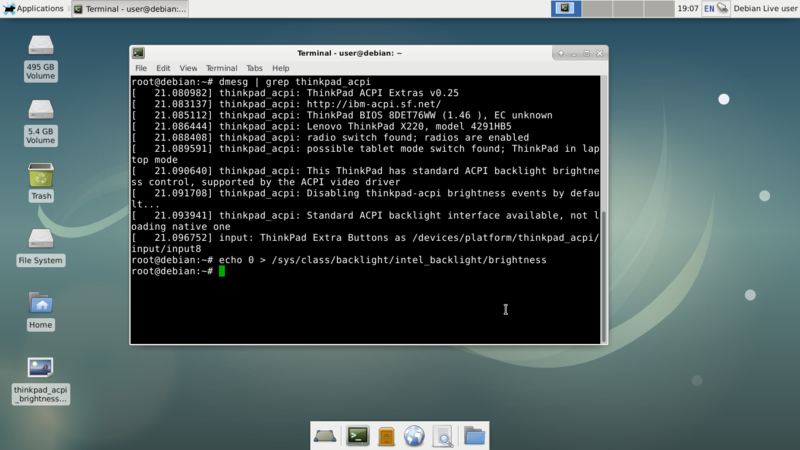 Only with Universal VESA/VBE OS start but this driver not support 3D and not work brightness control. Are you talking about VGA.SYS? There are plenty of things that one does not support, including Standby (Hibernation should work, though). The brightness is probably not controlled by the EC. The graphic driver can control brightness. It's quite possible you are right. Modern Thinkpads do not support brightness control in BIOS, for example. It's possible that the BIOS for older Thinkpads actually implemented a routine to capture and handle the brightness control. With these limitations, is there a point to continue running XP x64 in EFI mode, after you proved that it can be done? Read this post or whole topic: Does Windows XP have EFI? It is interesting that in the BIOS or WinXP it is impossible to disable the screen completely using Fn+End, while in Linux you can disable it completely. On BIOS/WinXP is 15 levels of brightness, but on Linux is 10 levels. Last edited by tpx61 on Mon Nov 12, 2018 5:19 pm, edited 1 time in total. I looked it at already in the previous thread where you discussed it. I understand that it can be done, my question is - why would someone want to? What are the advantages over running it in "Legacy" mode? my question is - why would someone want to? What are the advantages over running it in "Legacy" mode? Nobody needs to want. I just wanted to check and show that WinXP can be run in EFI mode. I think that this is very interesting. Your going to need the driver to get the brightness control to work properly. X210 EC datasheet/better brightness control?